In the nineteenth century, Marion was composed primarily of Methodists and Baptists. 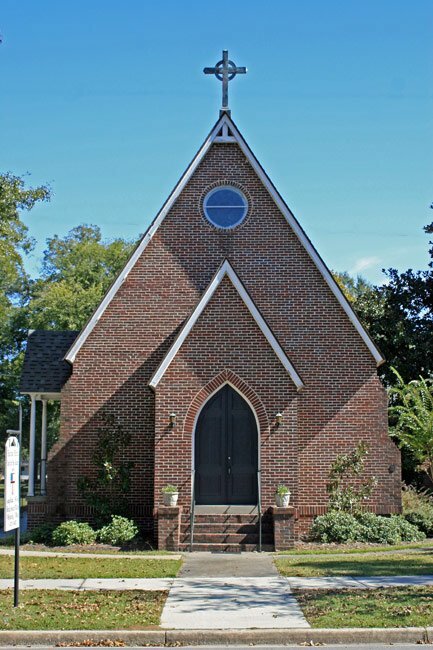 When the Church of the Advent formed in 1867, it was the only Episcopal church in the community. However, Episcopal churches were extant by the 1730s in other parts of Marion County, then known as Frederick’s Parish. The Church Act of 1706 established a parish system in which political districts were governed by the Church of England. These parishes were abolished after the Revolutionary War, and roughly a century later, Methodism began to spread through circuit-riders, or preachers who traveled to remote areas by horseback. 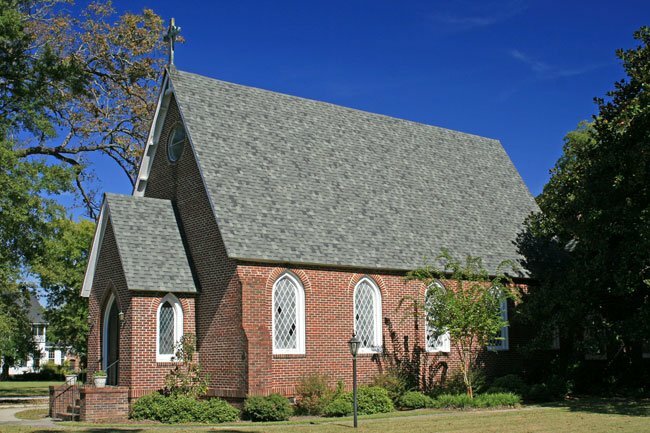 As a result, some formerly Episcopal churches became Methodist, such as “Old Neck Methodist,” now known as Central United Methodist, in nearby Brittons Neck. The Church of the Advent was founded shortly after the Civil War in 1867, making it the only one of its denomination in the area for years. The cornerstone was laid in 1880 by the Reverend Steele, and in 1883 the Carpenter Gothic style-sanctuary was dedicated by the Bishop Howe. The wooden church was covered with brick veneer in 1928, giving the structure its present appearance. 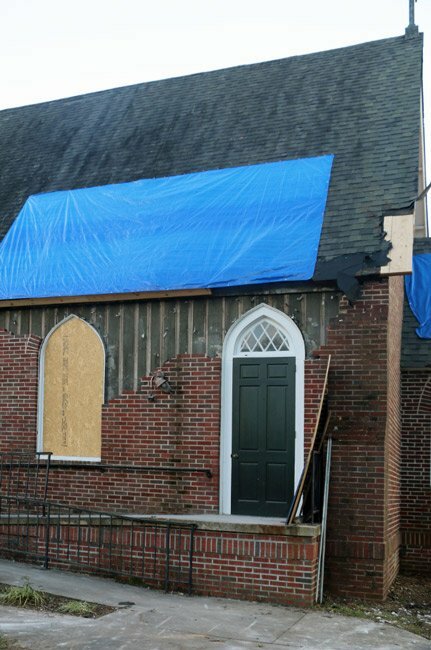 Damage to the church resulting from Hurricane Matthew, which struck South Carolina on the morning of October 8, 2016, revealed the church’s original board and batten siding. In the below above, wood is exposed beneath the brick veneer of the church. The Marion Historic District includes both commercial and residential structures having both historical and architectural value. The residential structures are primarily wooden and are one or two stories high. The area is representative of the various styles of classically derived nineteenth century architecture. In evidence are the early frame structures of the 1800s, the antebellum houses with Greek Revival porticoes, the raised cottage style typical of the Pee Dee, and the Victorian homes of the turn of the century. Other styles include Romanesque Revival, Gothic Revival, Queen Anne, Colonial Revival, and Bungalow. The central business district retains visual continuity and unity in terms of height, scale and setback. The majority of these buildings are brick, one or two stories high, and situated along the sidewalk with no setback. As both a county seat and railroad town, Marion was important in the growth of South Carolina’s Pee Dee region. The town was named for Revolutionary War hero Gen. Francis Marion.